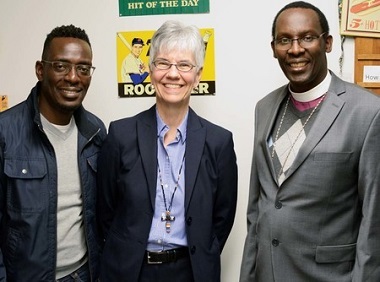 Bishop Fred Sheldon Mwesigwa (right) with his old friend Michael Musherure and Bishop Melissa Skelton. Photo by Randy Murray. Humility, repentance, brokenness – those are the hallmarks of revival. And those are the words I heard repeatedly from Bishop Fred Sheldon Mwesigwa when I met with him last week to discuss the purpose of his visit. The Revival movement was ignited following spiritual reflection, fervour [and] a call to repentance of sin and to preach the word of God so as to win souls for Christ. . . . Although the Revival was pioneered by the laity and initially resisted by the clergy, it has now become the overarching tradition of the Church of Uganda . . .
Drs. Joe and Decie Church. 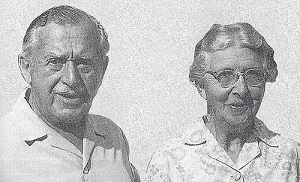 September 1929 was an all-time ‘low’ for Dr. Joe Church, missionary in the tiny East African slate of Rwanda. The country had just experienced the most terrible famine; his fiancee was ill in Britain and he feared she would not be passed fit for service in Africa, and he had just failed his first language examination. Worn out and discouraged, he decided to take a break in Kampala, the capital of neighbouring Uganda. Joe Church stayed with friends on Namirembe Hill and on the Sunday morning walked up to the cathedral. Outside it was an African standing by his motor-bike. His name was Simeoni Nsibambi. ‘There is something missing in me and the Uganda church. Can you tell what it is?’ Simeoni asked Joe. The two men spent two days studying the Bible and praying together. In a subsequent letter home, Joe wrote: “There can be nothing to stop a real outpouring of the Holy Spirit in Rwanda now except our own lack of sanctification. '” Both men were transformed and Joe went back to Gahini in Rwanda a new person. Immediately conversions began to take place, and Christians started to confess faults and resentments to one another. Forgiveness was experienced and broken relationships restored. The East African Revival had started. From Rwanda, it spread to Uganda and Kenya. Its effects have been more lasting than almost any other revival in history, so that today there is hardly a single Protestant leader in East Africa who has not been touched by it in some way. . . .
[The] East African Revival brought everywhere healing and unity, and this was one of its great achievements. Missionaries were humbled, stripped of racial pride and able to enjoy deep Christian fellowship with African leaders, who also had such a deep understanding of Jesus’ reconciling death as to free them from resentment against the whites. Bishop Mwesigwa said there are still many signs of the cultural changes which came with the revival: “Because of the word of God, people’s lives have been transformed.” He pointed out that he, and many other Ugandan church leaders, do not drink alcohol, which he says leads to a lot of problems, including sexual immorality. 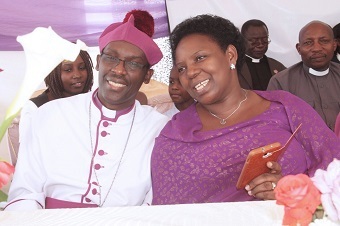 Bishop Fred Sheldon Mwesigwa and his wife Alice. Bishop Mwesigwa’s friend and fellow Anglican, Michael Musherure – they knew each other before Musherure moved to Canada – remembered that his grandmother got saved in 1945 after getting drunk. She moved from a life of smoking, drinking and immorality to the one he grew up with, of humility and devotion to Christ. The revivalists upheld certain fundamental values which included confession, repentance of sin, restitution, walking in the light, brokenness, praying, fellowship meetings, witnessing for Christ [and] reading the Bible twice a day – before daybreak and after dusk – using Bible reading notes known as Kishumuruzo. They valued education, hard work, honesty and cleanliness in their homes. Although they were few in number compared to the children of the world, they changed the communities in which they lived and the fortunes of the nation to which they belonged, by their prayers; they were the life blood of this country, the shield, the defence, the stay and support of this nation (1 Timothy 2:1-7, Ezra 7:25,28). Theirs was a pure and undefiled religion and they worked hard to spread it. 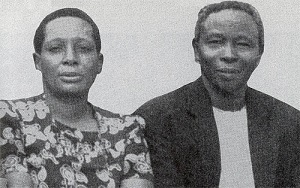 The East African Revival was indeed a unique blessing to Ankole and Kigezi, and to Uganda and East Africa as a whole, and remains so. During his time in Metro Vancouver, he visited Bishop Melissa Skelton and other members of the Anglican community, but also attended Peace Portal Alliance Church in South Surrey and met with representatives of Regent College and Trinity Western University.